One word to sum it up: Haunting. Going into Winter's Bone, I had two opinions on the movie which were engraved in the back of my mind while I was watching it. The first one was that this film was wildly successful at Sundance, and was popular around the independent film parts. The critics in high places hailed it as beautiful and haunting, and despite its indie trimmings, it got an Oscar nomination for Best Picture. The other idea I had in my head is that it would be a total bore. I had read many reviews and many comments about the film that proclaimed this as a boring and sluggish piece of work that failed to touch the viewer on many accounts. Hence the reason I put off watching it for so long. Fortunately, the latter opinion turned out to be untrue on my behalf. 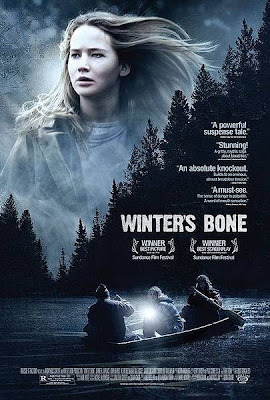 In fact, I really, really liked Winter's Bone. Speed is something that Winter's Bone may lack when its telling its story, but that makes for an ample opportunity to make things set in. 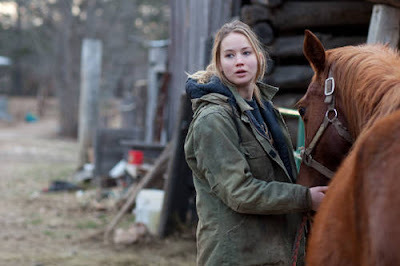 Our heroine is 17 year old Ree Dolly (Jennifer Lawrence), a girl living in near poverty in the Ozarks who has to look after her younger siblings when her mother becomes unresponsive. She finds out that her father is being hunted, and if the police don't find him, they will sell the Dolly's home from underneath them. Ree stands up and fights for her right and desperately searches for her father. Here she is introduced to the dark world her drug addicted father got himself into, and must find a way to get the truth, even if it means getting beaten and having her family starve in the process. Yes, Winter's Bone may seem boring to someone who doesn't bother to unfurl the films themes. Because the themes that this movie holds are fantastic. 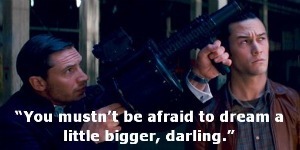 One of my favourite themes within the movie is the power and speed of gossip. The reliance on distant hearsay becomes the thing to make or break the characters and the predicament they have found themselves in. Another theme is the power that close and distant family ties can have. Many of the people Ree meets do not wish for her to poke her nose into all of this business. Some will completely turn on her, others will help in a small way. But the end result comes through by Ree intelligently picking up small pieces from her encounters, and then meeting a tie which gives her exactly what she needs...no matter how deeply disturbing it is. Debra Granik and Anne Rossellini's adaption of the 2006 novel by Daniel Woodrell is depressing, but there is some hope in Ree and her family, which keeps this from sinking to an almost unfathomably bleak level. Carrying the film on her small but well able shoulders is young Jennifer Lawrence. Her performance is on such a professional level that she'd have you believe that she's been doing it her whole life. Her bottled-up emotion, toughness and want for a better life combine as perfect characterization and you really feel for Ree, even if her no nonsense nature sometimes gets the better of her. Her performance is backed up by a brilliant Oscar nominated turn from John Hawkes as Teardrop, a man afraid to lose his cover that eventually becomes a helpful figure in Ree's journey. Dale Dickey, too, makes a good opportunity of her character Merab. Had the parts gone to more well known actors, I suspect this film would have lost the indie gloss it has over it and probably wouldn't have been anywhere near as successful. I'm glad that this got the opportunity to be an Oscar nominee, though. THE VERDICT: Though a tad slow, Winter's Bone is bleak, dark and depressing, but haunts the viewer for a while after the credits roll. Jennifer Lawrence makes a star of herself in this. More I think about it, more I dislike it. I don't mind Hawkes and Lawrence's nominations, but BP? No, IMO. It is a strange nomination, considering there were other more worthy films out there, but I liked it enough.